What is a ‘nerve’ and what happens when bacteria enters this area? Dental pulp, better known as ‘the nerve’, is the inside soft part of the tooth, that among other things contains blood and nerve vessels. This whole complex is responsible for feeding the tooth and maintaining its defense function. The dental pulp defends itself by depositing minerals on the inner wall of the dental chamber in a way that more mineral is deposited on the portions where bacteria enters the tooth or in other words on the area where cavity is formed. The dental pulp also lets us know, via nerve vessels, that there is a certain injury to the tooth, and this message is transmitted in a way we don’t really like and that’s pain. This may even be a good thing since it urges us to act by visiting the dentist. 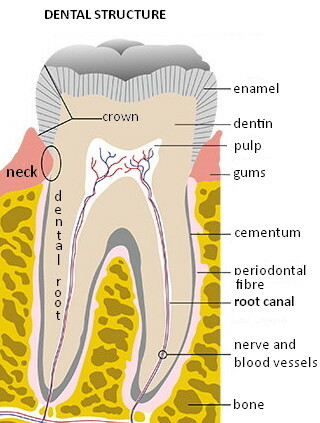 Through the progression of cavity, bacteria move closer to the nerve and in the end they enter that area of the tooth. Through the entrance of bacteria into the pulp certain changes start that in the end cause the deterioration of the pulp which is also a start of the more unpleasant symptoms. 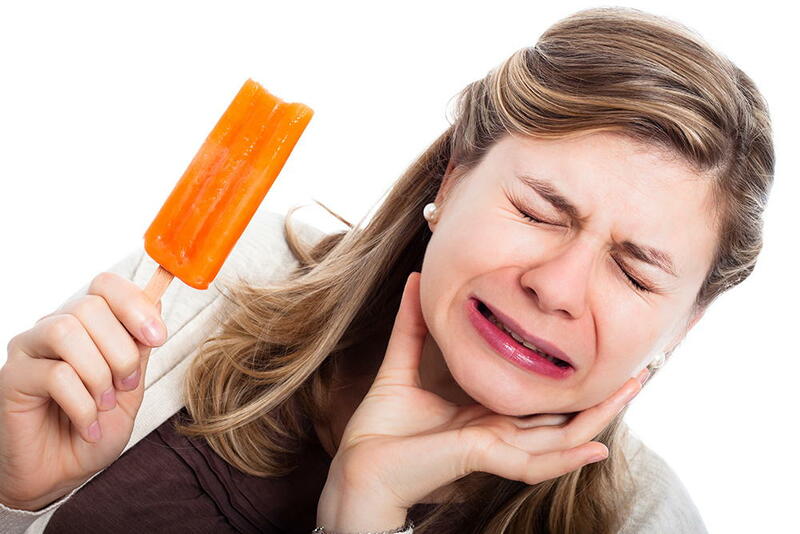 While in the initial phases of cavity most people get sensitivity to cold and sweet food and drinks, when the bacteria breach the pulp the pain to these stimuli gets stronger but it also spreads to heat. After some time the pain starts lasting for a minute, then half an hour, and finally up to an hour or even longer. In the end the pain starts without any stimuli, it lasts for a long time; it’s very intense, sometimes almost unbearable. The areas that are usually affected by pain are parts of the face; sometimes the entire half of the face and it’s very difficult to determine the pain’s origin. There are rare cases when the bacteria destroys ‘the nerve’ while the patient didn’t feel any pain at all. The deterioration of the nerve due to a bacteria inflammation isn’t the end of the progression of bacteria. The inflammation continues along the root and it ends on its top. That is the time when strong pain starts again. The difference is that the tooth starts hurting on pressure and thanks to that it becomes easy to determine the tooth that is the source of pain. If this situation is neglected, the bacteria piles up in the top of the root where it causes a strong inflammation of the surrounding tissue. This inflammation causes a dental abscess due to accumulation of pus. You’ve probably seen the state of people that are swollen due to dental problems. This is the exact consequence of such inflammation. All these situations require urgent dental help that can remove the pain in a quick and efficient way, but after that the patient also needs a therapy with the aim of suppressing the inflammation, removing the bacteria and the infected tissue and ultimately saving the tooth.